The biggest challenge when cooking smoked turkey is to ensure that it doesn't dry out. I've heard all sorts of ideas from cooking the bird upside down to covering with foil and bacon and to be fair some work and other are a bit of a gimmick. However long you cook your turkey for, when finished, remove the bird from the smoker and all it to rest for the exact same amount of time again. For example, I do a 10 pound turkey for about 3½ hours at 225°F or 110°C in my Big Green Egg and when the bird is cooked, I take it out and let it rest for a further 3½ hours. Serve on hot plates with hot gravy and no one will notice. If you carve too early ie. 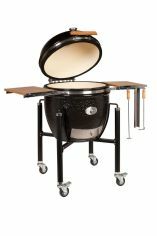 when it's hot, the juices won't have set and then they all run out and the meat dries – especially the breast. Try it, you won't be disappointed. I have had some comment over food hygiene concerns about leaving a meat for this long out of the refrigerator. Such a large mass of meat will take time to cool naturally anyway and so much so that you wouldn't be able to put the whole turkey in a domestic refrigerator any earlier for fear of raising the overall internal temperature of the refrigerator. Use a water bath to maintain the humidity in your smoker. 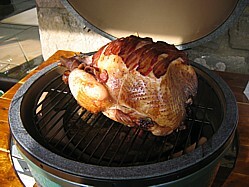 Insert butter under the skin and layer streaky bacon on the top (check this barbeque turkey recipe as an example. Smoke with a fruit wood. For me, turkey is best cooked with a subtle smoke flavor. Sometimes I don't use smoke at all, just indirectly cooked in a well seasoned smoker is enough. To brine or not to brine? I think that it's a matter of taste, certainly it adds a different dimension to the final flavor and it does require an element of trial and error to get the brine strength and brining time correct for the flavor that you prefer. To help you decide, use this link to explore a myriad of turkey brine recipes and science behind the brining process.